An outstanding inventor and engineer, Howard was also talented artistically, and was a founder of the Flushing, New York church. 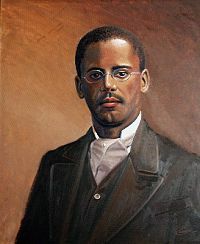 He was born in Chelsea, Massachusetts on September 4, 1848 only six years after his parents, George and Rebecca, had escaped from slavery in Virginia. Shortly after arriving in Boston, George was recognized as an escaped slave. After the courts determined that he still belonged to his owner, abolitionists helped purchase his freedom. Lewis was the youngest of four children. He enlisted in the Navy when he was 16. After the Civil War ended he returned to Boston and took an office job in a patent law firm. Latimer had always loved to draw, and he taught himself mechanical drawing. He was soon promoted to the much higher paying job of draftsmen. Latimer met Alexander Graham Bell, who asked him to draws plans for the telephone, and eventually provided Bell with blueprints and filed the papers so that he had the first telephone patent on file. In 1880 Latimer began working as a draftsman and assistant manager for Hiram Maxim, who was a founder of the U. S. Electric Light Company in Brooklyn, New York. This helped him to understand light bulbs and lamps, and he soon developed a reputation for making improvements in electric lighting. One problem with Thomas Edison’s light bulbs was that they only lasted a few days. Latimer was able to design a new bulb, that encased the carbon filament in an envelope so that the bulbs lasted longer and became cheaper to produce. He helped to install electric plants for Philadelphia, New York and Montreal. Thomas Edison became aware of Latimer’s amazing skills, and hired him in 1884. His knowledge of electric lighting and patents proved invaluable. Edison made him a draftsmen and engineer at first, and later his chief draftsmen and patent expert, who investigated those who used Edison’s inventions without permission. In 1890 Latimer wrote Incandescent Electric Lighting: A Practical Description of the Edison System, which explained how the lamps worked. Latimer was married to Mary Wilson in 1873, and they had two children. He was also a brilliant poet and playwright, who also painted and played the flute. His poems were published as Poems of Love and Life. Latimer was one of the founding members of the First Unitarian Church of Flushing, New York. The church began to have informal meetings in 1905, and incorporated in 1908 with Latimer being a charter member. The church started a building fund in 1914, and began to erect their building in 1916, with Latimer involved in some ways. He also served as a church auditor. His wife and family members also helped provide music for the society, and lead them in singing. He also used his skills to help immigrants by teaching drawing and English at the Henry Street Settlement House. He was involved in patriotic activities with the Grand Army of the Republic (GAR), and he was also active in civil rights work as well. He closed out his work life by working for a patent consulting business. Latimer died on December 11, 1928. His granddaughter, Winifred Norman, served on the Board of the Unitarian Universalist Association (UUA). His remarkable legacy of inventions meant that his name appeared on seven patents issued by the U. S. government. These included the more famous lamp fixtures, but also toilets for railway cars, a cooling and disinfecting system, and a locking rack for hats, coats and umbrellas. He was named an Edison Pioneer, as a founder of the electrical industry, the only African American to be so honored. Latimer can be credited with making it possible for society to have widespread use of the electric light.